The modern living room is complex and ever so beautiful. More than ever, is a representation of taste, personality, and is associated to a series of other personal factors. With the monochromatic pallet often taking over the black modern living room is increasing in popularity. Tastefully too! A little more sensitive than white, black and dark greys must be carefully selected according to each setting, and used in the right quantities, in the right locations. 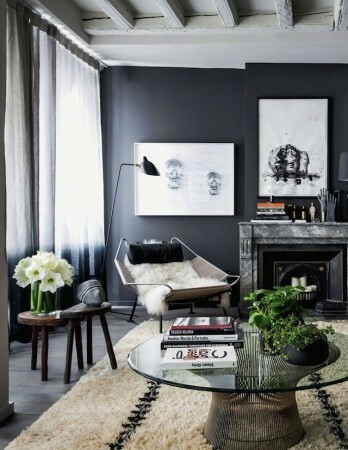 Black walls, white artwork and a the use of carpeting, makes for a strong combination of elements which play a determining role in the overall environment.